When will we be able to do things like login to bank apps, email, eBay, Amazon, etc with our fingerprint rather than passwords? Or will we? When developers incorporate the fingerprint api into their apps. It'll take some time, but get there eventually. I am using a Password managing app that already utilizes the fingerprint scanner, which is fantastic BTW. I suspect that it won't be long before more apps start utilizing the fingerprint API for log-ins. I believe LastPass uses the ImPrint API. I'm pushing the developer of my preferred password app to get it done but if they don't do it by the time I have to renew my subscription (this summer I believe) I may jump ship to LastPass or some other app that already supports it. As for the original question, it's incumbent on the developers to get off their backsides and get ImPrint added to their apps. I know there's some work involved but they should already be updating using the Marshmallow SDK so it can't be THAT much work to add it. It is actually pretty trivial. But unfortunately, the apps I want to see this in (banking, security) usually follow an insanely slow development cycle, and excuses can be made that MM's user base is currently so miniscule that it is not a priority. BofA already added it but it only works for galaxy phones. Pretty frustrating they won't add other devices. That's because they coded that part of it specifically for the Samsung fingerprint readers (which were not using the same APIs as are needed for Marshmallow support). Cant Miss is on the right track, devices running Marshmallow are a TINY portion of the Android share, and those running Marshmallow AND a fingerprint sensor are an even smaller portion. Developers will code to the most common denominator to get the largest user base. It's unfortunate that those of us on the cutting edge have to wait for those features to get added. I believe LastPass uses the ImPrint API. It does.. it's works fairly well. Though, the app fill stuff is still a bit clunky. I'd actually prefer to move away from Lastpass, though. It's a matter of trust and I trust Google with keeping my crap locked up than Lastpass (who recently got sold I think). Now that it is built into Android, you'll start to see most anything that requires user auth to come into the fold. Every phone will use the same system. LastPass is part of the LogMeIn family. LogMeIn, if you're not familiar, is a suite of tools that can be used by support groups to remotely provide assistance, either through chat only or as a remote control tool. LeoRex, if you're looking for a new password tool, I use RoboForm and have been happy with it. They have Mac, Windows, Android and iOS versions as well as toolbars for all the major browsers. They just did a Material design makeover of the Android app, ImPrint support can't be TOO far behind, though it took about 6 weeks to bring support for Marshmallow (that support coincided with the Material update). Their support is quick to respond but is not really knowledgeable about where their build teams are with releases. Syncing your database across devices requires an "Everywhere" account, read up on their security before dismissing it. Glad I found this thread... My previous phone was the Galaxy S6 and it allowed me to login to my banking apps using the fingerprint. For some reason I can't my nexus 6p to do the same. It seems like we're a year from developers taking advantage of this. I only have one app, Scotiabank on iOS that takes advantage of it. Seems like pretty slow uptake IMO. I keep looking forward to this on my Nexus P but so far zilch. I have probably 10+ apps on iOS that use touch ID. Apple Pay, Chase, BoA, Amazon, Ebay Schwab, even Google Wallet on iOS uses touch ID for goodness sakes. BoA has it for my Galaxy S6 and iOS but not Nexus. They built the api in for the S6 specifically. And that is PRECISELY the problem with Android fragmentation and really Samsung in general. Samsung goes and does something on their own and it's actually adopted pretty quick by some developers (did Samsung incentivize them? ), once the same capability is added to the core Android build it seems to take FOREVER for developers to realize more people can use it and add the new API to their app. True but we are in year two for fingerprint scanning in iOS nexus imprint still very new. If other OEMs start to take advantage of it, it will start to move faster. Heck in canada banks don't even support mobile payment on a nexus which is really weird as they updated their apps in general for marshmallow. I don't think so... I do remember Samsung saying that they designed their own fingerprint system to allow it to dovetail with Imprint, even on the Galaxy S5 line. So when the current FPS supported Samsung phones get 6.0, they'll be using the Imprint API in all likelihood. Devs are aware... think of it this way... there are only a select number of apps that have tight integration into Samsung's API... why is that? It certainly isn't because there aren't many S6's and Notes out there, far from it. I think the reason we haven't seen widespread adoption of fingerprint integration was that devs were well aware that fingerprint support was going to be widely available in Android, meaning they will only have to develop one method into their software. Now that Imprint is out in the wild and the devs have the API calls in house, it is just a matter of time. SafeInCloud, another app that already uses imprint. May be when more and more phones have fingerprint sensors then service providers and vendors can bring in authentication features using the fingerprint to their phone. It would cool now if someone pointed me to an app that allows us to configure what happens when we scan different fingers. Sorry I am a little bit slow to respond, but the app that I am using is just called Password Manager. I have been using this app for years and while it is not the fanciest app out there, and can be a little clunky sometimes it is very simple and works well as just a 256bit encrypted spot to dump your passwords and requires very little permissions to run. I suggest you contact the developer. As the others of us have discussed, it's not as simple as "fingerprint is available so any apps that have logins can now use the fingerprint". The developer needs to specifically incorporate the fingerprint API into their app and utilize for the login. If that is a response to my post then I think there was a misunderstanding. 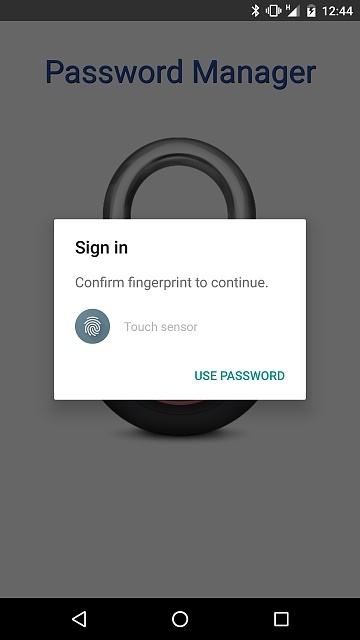 The password manager app that I am referring to has already included the fingerprint API and I have been using it with the fingerprint scanner on my 6P for a few weeks already. it took months to see 3rd party apps developer support touch id on ios. we have only started seeing this more frequently in the last few months. nexus imprint is very new and more people need to be on Android M for developers to start considering it.